DNA transcription refers to the synthesis of RNA from a DNA template. The process is the first step in gene expression, which is followed by the translation of mRNA (protein synthesis). Initially, the gene (double-stranded DNA) is copied or transcribed into an virtually identical single-stranded RNA molecule (mRNA). In eukaryotes this process occurs in the nucleus and is catalyzed by the enzyme RNA polymerase. This enzyme attaches itself to a portion of the DNA strand and replicates it, then sending out the mRNA to machinery in the cytoplasm that use the information contained in the gene to make a protein. Transcription is very similar to DNA replication although different proteins are involved. The most important enzyme is RNA polymerase, an enzyme that influences the synthesis of RNA from a DNA template. For transcription to be initiated, RNA polymerase must be able to recognize the beginning sequence of a gene so that it knows where to start synthesizing an mRNA. It is directed to this initiation site by the ability of one of its subunits to recognize a specific DNA sequence found at the beginning of a gene, called the promoter sequence. The promoter sequence is a unidirectional sequence found on one strand of the DNA that instructs the RNA polymerase in both where to start synthesis and in which direction synthesis should continue. The RNA polymerase then unwinds the double helix at that point and begins synthesis of a RNA strand complementary to one of the strands of DNA. This strand is called the antisense or template strand, whereas the other strand is referred to as the sense or coding strand. Synthesis can then proceed in a unidirectional manner. Although much is known about transcript processing, the signals and events that instruct RNA polymerase to stop transcribing and drop off the DNA template remain unclear. Experiments over the years have indicated that processed eukaryotic messages contain a poly(A) addition signal (AAUAAA) at their 3' end, followed by a string of adenines. This poly(A) addition, also called the poly(A) site, contributes not only to the addition of the poly(A) tail but also to transcription termination and the release of RNA polymerase from the DNA template. Yet, transcription does not stop here. Rather, it continues for another 200 to 2000 bases beyond this site before it is aborted. It is either before or during this termination process that the nascent transcript is cleaved, or cut, at the poly(A) site, leading to the creation of two RNA molecules. 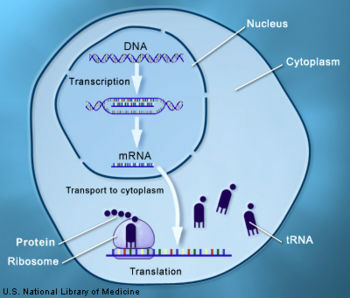 The upstream portion of the newly formed, or nascent, RNA then undergoes further modifications, called post-transcriptional modification, and becomes mRNA. The downstream RNA becomes unstable and is rapidly degraded. Although the importance of the poly(A) addition signal has been established, the contribution of sequences further downstream remains uncertain. A recent study suggests that a defined region, called the termination region, is required for proper transcription termination. This study also illustrated that transcription termination takes place in two distinct steps. In the first step, the nascent RNA is cleaved at specific subsections of the termination region, possibly leading to its release from RNA polymerase. In a subsequent step, RNA polymerase disengages from the DNA. Hence, RNA polymerase continues to transcribe the DNA, at least for a short distance. 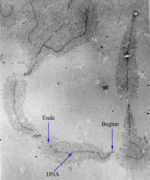 Electron micrograph of Ribosomal RNA transcription units of Chironomus thummi (Diptera). Magnification - 40.000x. During transcription there needs to be a promoter. A promoter is a certain sequence of DNA which RNA polymerase can bind to. It creates a very tight bond with the promoter. There are at least one promoter for every gene in the genome. The direction to take from the start. After the specific promoter has been chosen by the RNA polymerase a process called elongation begins. This process is where the polymerase adds nucleotides (A, U, C, G) to a section of DNA of about 20 amino acids and replicates it. However it is created antiparallel to DNA. DNA is 5' to 3' and RNA transcribes as 3' to 5'. The elongation process will continue until it reaches a certain termination site in the DNA. There is also a specific initiation site the tells where the transcription is to start taking place. RNAs can be edited by splicing to increase the number of proteins it can create. A pre-mRNA (immature mRNA) goes through a process of splicing where sequences called introns are removed, and the remaining code (called exons) are spliced back together. Introns are sequence of non-coding DNA, a portion of a gene that does not code for an amino acid. When the genome is analyzed most gene sequences are found to contain introns. 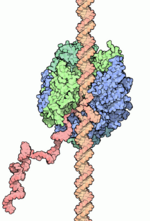 The portion of the gene that is expressed in the protein are called exons. In the cases of the protein tropomyosin the pre-mRNA can be spliced to create five different mature mRNA's. This is the reason why the human body only has 21,000 genes rather than the 100,000 to 150,000 genes estimated by scientists. This type of editing greatly increases the number of mature mRNAs and therefore the number of proteins that can be created from a single gene. The edit above will effectively alter the amino acid sequence from trp-arg, to trp-phe-arg. ↑ "Intron." Encyclopædia Britannica. 2010. Encyclopædia Britannica Online. 17 Jul. 2010 <http://www.britannica.com/EBchecked/topic/292125/intron>. This page was last modified on 22 April 2015, at 13:05.